Everything was perfect! Great place, would highly recommend! Plenty of room for 3 people. Very clean and well appointed. I would recommend to owners to provide a blow dryer for hair. We really enjoyed our stay here. This is the 2nd time we stayed here & it keeps getting better & better. The patio is delightful and shaded by a 100 year old grapevine and is very private. The apartment was spotless and the location can't be beat. There is a wonderful pastry shop right next door and restaurants everywhere. Silvia & Diego are wonderful hosts. Absolutely loved this place! The hosts were nice from the beginning. I was in the single bed room which is small but exactly as I expected, the courtyard is shared with others staying in the other available rooms which makes for a great atmosphere and chances to meet hiking/ drinking/ eating friends. Definitely stay here if your travelling solo and want to experience Monterroso and the surrounding towns! Great place. Silvia and Diego were lovely! 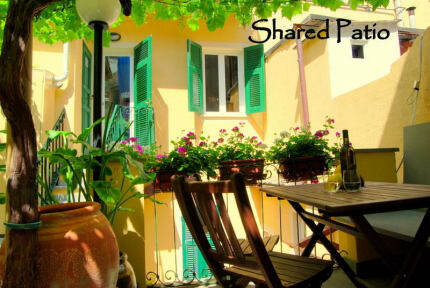 Could not ask for better experience , small but clean room excellently located on a lovely terrace in beautiful monterroso al mare, my favorite of the cinque terre. Silvia the host was so lovely and helpful gave great advice regarding hikes in the area and was there to greet me when I arrived in the evening making sure I got in okay. Lovely single little room BUT the accommodations were better than a hotel. Everything what I needed (and more). Location is perfect - it is also close 5 min and you are near the sea. Awesome hosts, very helpfull and friendly. I really loved the single room and sure will back againe. 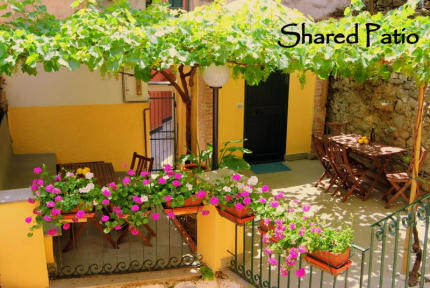 We stayed with our 3 teenage children in one bedroom apartment which overlooked and was accessed via little courtyard. It was very clean and staff were very helpful. I would have no hesitation in recommending to anyone including a family. It is ideally located close to restaurants and little beach and lots of shops and walks. There was a lot of noise through main bedroom windows at night but if you want to be centrally located that can be expected. Very small but clean and comfortable room. Shared bathroom was also small but with good shower. Great location and friendly staff. Unfortunately even though the welcome book states you can use the kitchen facilities they were closed to use as they rented out that area. Silvia and Diego were very accommodating in allowing me to leave my bag early even though the room wasn't ready which was really appreciated! Room was very small but it had everything I needed. I was out every day hiking so it was perfect for sleeping etc. The location is flawless - close to a great beach, restaurants, and hiking tracks. Silva was so helpful and assisted me with all my questions. I would definitely recommend staying there! Loved Silvia and great location! !